If we look at January only, the national debt reached $85.32 billion — nearly 150% of the gross domestic product — an increase of $4.93 billion compared to January 2018. The reasons behind this drastic increase are mainly 1) the public sector’s salary hike bill and 2) the increase in expenses and lack of cost-cutting initiatives by the authorities. 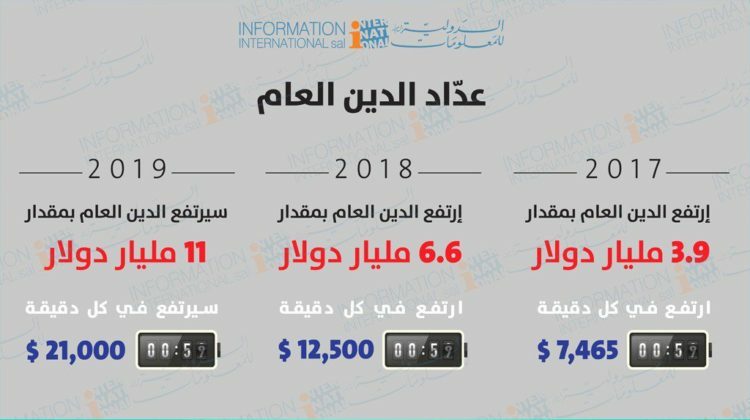 S&P Global Ratings has already revised the outlook on Lebanon to negative from stable on Friday, amid worries about the ability of the world’s third most indebted country to pay its foreign debt, yet we still don’t have a budget for 2019, and there are still no concrete steps to make cuts and reduce the deficit. The Central Bank is always re-assuring everyone that the situation is stable but has already taken measures to protect the Lebanese currency and some are questioning his latest move, where the balance sheet shrunk by some $22 Billion dollars. All in all, we’ve been receiving warnings for months now yet nothing has changed. No budget, no serious initiatives by the newly formed government, an increase in expenses, hundreds of thousands of dollars wasted on VIP Lounges, private jets, delegations, you name it! The only way to have the $11 billion in soft loans from CEDRE released is to reduce our deficit by 5% over the next five years and so far it looks like we’re set to increase that deficit.